Why not record a book before deployment? The serving parent can record their own story book, bringing their voice to bedtime for your child(ren) and is free to do. Simply go online to the RAF Association’s Storbybook Wings page for more information. Military mum, Jo has set up Huggable Heroes and simply prints your loved one(s) photos onto fabric, ready to make into the perfect sized cuddly toy. The Heroes fit perfectly under little arms to carry around and they are small enough for older children to tuck into school bags. Prices start at £25 (payment plans are available). This organisation is a registered charity, founded and run by military wife, Louise Fetigan. Little Troopers main objective is to support children with parents serving in the British Armed Forces, regular or reserve. There is a variety of support available such as separation packs, colouring in cards, residential trips and other events. You can sign up to their newsletter to be kept up to date on what’s available and when. Louise has also written a blog on her families own experience during a 2018 deployment sharing the stresses and strains on the family at home. All aimed at hoping to open up the conversation and raises awareness of challenges by being a military child. Reading Force keeps forces families close and connected during deployments and long periods away through sharing stories. It offers support (free books and scrapbooks) to both families, schools or welfare clubs. Their shared reading initiative encourages families to read, talk, and scrapbook about a book, improving communication and enriching relationships with books and each other – one page at a time. 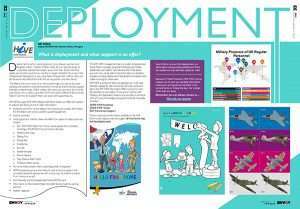 There is a booklet available online with children and young people as a focus aimed at helping you to help your young family members cope with deployment. The Royal British Legion has also produced some downloadable guides on Supporting Service Children in School.